Many of our clients are experiencing complex and ambiguous challenges in their business environments which often require a radical rethink of their current organisational structures and the ways in which they design and deliver products and services. Contexts such as these necessitate changes in both behaviour and attitudes, and for this to be successful, it is necessary for the learning to be equal to, or even greater, than the rate of change. Change is not a simple process neither is it a comfortable one. 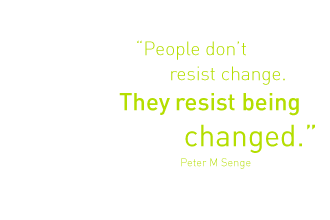 Effectively introducing change is difficult since a common response to change is resistance. Many senior leaders underestimate the level of resistance their change initiatives will face and therefore also underestimate the time and resources needed to bring about successful implementation. At TBG we have found our expertise and experience in action learning to be an effective framework to support and accelerate managers going through major change. At TBG we help organisations to design and plan change that is positive and directional – change that represents progress, both for the individual and the organisation. Our approach has been influenced by a number of models of change which provide a guiding framework within which to work with our clients. These frameworks can help people to understand and appreciate the common experiences that change evokes and explore the best of the ideas that can assist and support successful change initiatives. The appreciation that all of us go through a form of ‘grieving cycle’ during periods of transition, albeit in different time frames and at different depths, has proved helpful to many of those we work with. We feel it is important to understand the difference between change and transition. Here we draw on William Bridges model.1 He sees change as situational: the new site, the new structure, the new team, the new role, the new procedure. Whereas transition is the psychological process people go through to come to terms with the new situation – change is external and transition is internal. This can be illustrated in a recent piece of work within the NHS with a number of community service clinicians who were moving from an operational clinical role to one of managing a team, thus needing to think strategically about service redesign. The change is the new job role, but the transition is from the familiar operational clinician to the unfamiliar strategic manager. In effect many models that talk about change are in fact talking about transitions. To assist people through transition Bridges indentifies three phases: the first is endings, where situations become more fluid; disengagement begins, letting go of the familiar, and a sense of loss. The second is the neutral zone where people experience confusion and disorientation; they might feel as if they are in a state of flux, but where the old ways appear to no longer be working. The third phase is new beginnings, this is where the new behaviours begin, but where there is still risk and uncertainty, and a possibility of failure but also excitement and anticipation. Manfred Kets De Vries suggests that; “If the human tendency is to resist change, how does the process of change ever get underway? Why does a person’s resistance start to weaken?” 2 His view is that there are five stages people tend go through in the change process. First, they need to experience a sense of concern about their present situation. Secondly, they need to experience confrontation, some focal event such as an external threat to their well being or observation of negative consequences to self and others. The third stage is one of clarification, where sudden insights, the envisioning of new alternatives, the reappraisal of goals, and a public declaration to change take place. The fourth stage is one of crystallisation (or inner journey), where the interpretation of discontent takes place, insights are worked through, and there is an increase in self knowledge. Finally the fifth stage is the internalisation of the new mindset. And be greater than …. Individuals will resist change unless A + B + C is equal to or greater than RD. Although he calls it a ‘Change Model’ we think he is actually describing transition. Some people recognise De Vries’s view that a high degree of discomfort with the present might be the only factor needed to encourage change, while for others Gleicher’s view that a combination of factors needs to be equal to or greater than the pain involved in the transition, mat well be their experience. The Stages of Change Model put forward by James Prochaska and Carlo DiClemente4 argues that in all change there is a pre contemplation phase where people do not yet see the need for change. This is followed by a contemplation stage when we begin to think about change. This is then followed by a preparation stage, then action, then maintenance, and finally we exit the change process and the new behaviours have become part of daily life. But even successful change can have a relapse where the old behaviours creep back. The key point about relapse is that it is a normal part of change. In the March-April 1995 issue of Harvard Business Review, John P. Kotter,5 a professor of leadership in the Harvard Business School, wrote of eight primary reasons that organizations are unsuccessful when implementing efforts to change. In summarizing his experience and research, Kotter said that the most general lesson to be learned from the more successful cases is that the change process goes through a series of phases that, in total, usually require a considerable length of time. Skipping steps creates only the illusion of speed and never produces a satisfying result. A second very general lesson is that critical mistakes in any of the phases can have a devastating impact, slowing momentum and negating hard won gains. Perhaps because we have relatively little experience in renewing organizations, even very capable people often make at least one big error. These are some of the approaches we have successfully used in our recent work with: the NHS Institute for Innovation and Improvement supporting their service re-design initiatives; NHS Sefton’s Change and Service Development Programmes; the international and multicultural Changeable Manager Programme for ING’s Business School; and a major Middle East programme which included cultural change for the Yemen Liquid Natural Gas company. The change equation was first articulated by Richard Beckhard and Reuben Harris, based on an idea by David Gleicher.